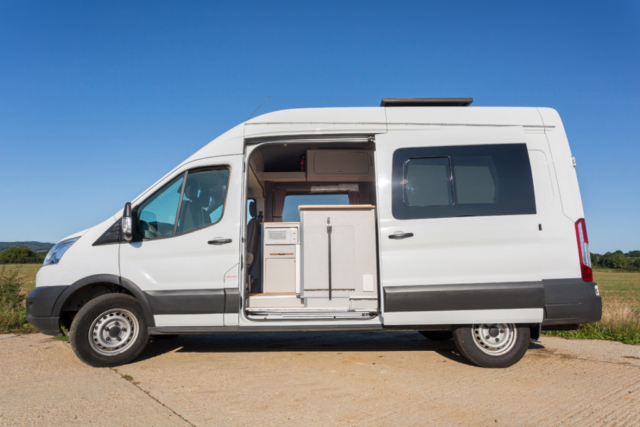 Our medium sized van conversions are available for any medium sized wheelbase van including the Volkswagen Crafter, Mercedes Sprinter and Ford Transit (other vans are available and most work equally well). Conversion only price from £14,495 + VAT. 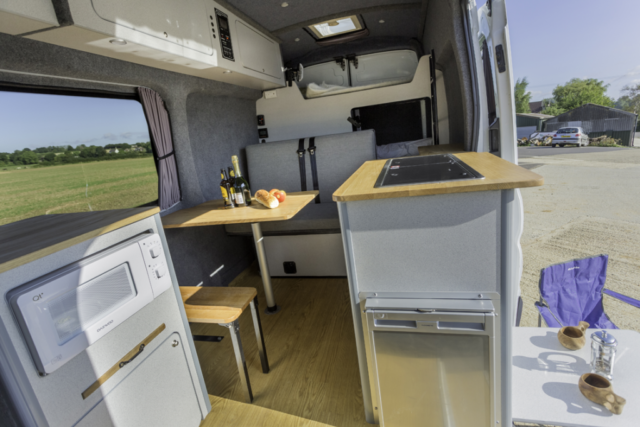 Our mid-sized campervan conversion has five berths and makes brilliant use of the space available. 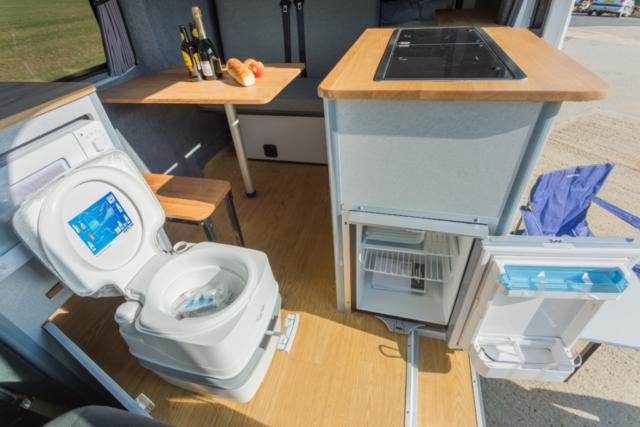 A toilet, 12v and 240V electric system including lighting, mains hook-up, power management system, two leisure batteries, multiple three pin plug sockets and usb ports, blinds, cooker with has hobs, grill and oven, and sink with large water tank are all included. 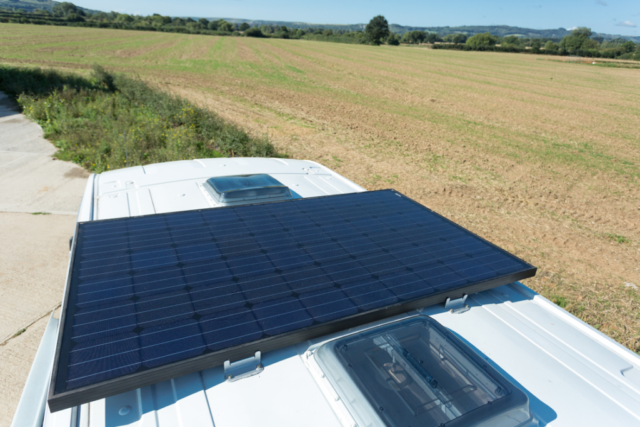 A solar system, central heating, integral radio and TV can be included at additional cost. 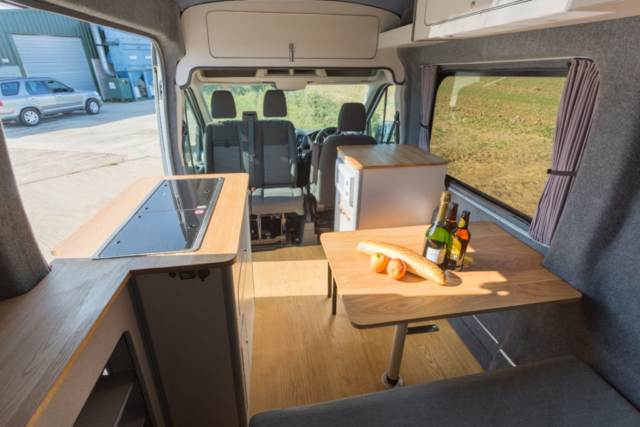 Like all our vans, the mid-sized van is beautifully designed and finished, and is perfect for short and long haul family camping trips. All the vans are fitted with back seat safety belts. Like the front safety belts these are three-point seat belts. There is a rocknroll folding double bed that also serves as a comfy seat, as well as a bunk bed with 3 bunks. The bunkbeds have curtains so can provide a bit of privacy and mean parents can sit up inside the van once the kids have gone to bed! 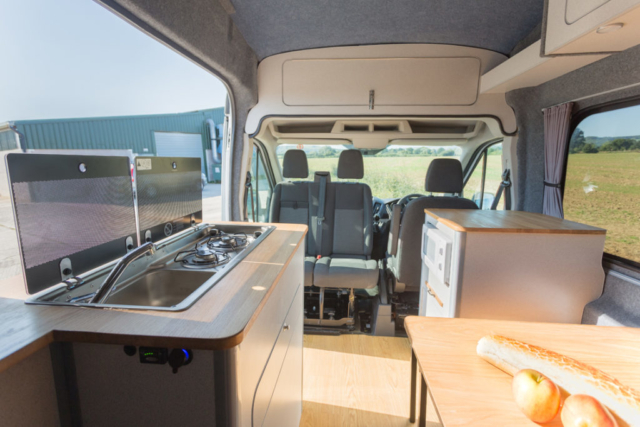 The mid-sized van conversion includes a ‘Cooking area’ with a sink, running water, oven, grill and hobs – and we can even fit a microwave as an optional extra. The water is supplied from the single large water tank. 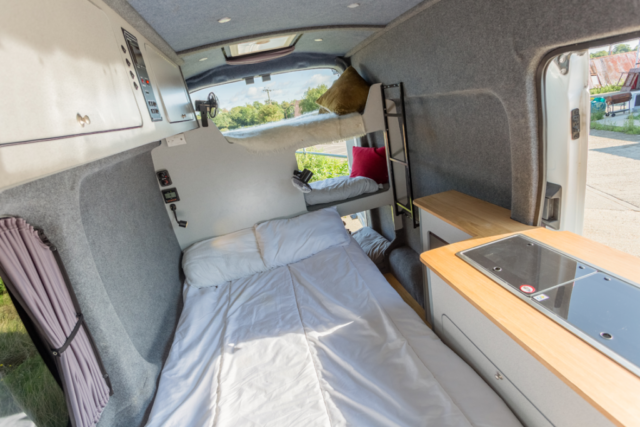 There are three pin plugs and USB charging points throughout the van as well as a swivel front seat and a folding table plus plenty of storage space for a van of this size, including a rear garage area for storage. 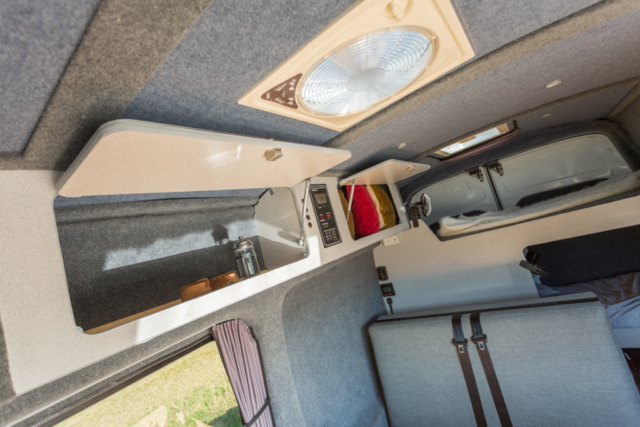 An electric vent will keep the air in the van fresh and for cold weather camping the gas airflow heating will keep the van warm. Its on a thermostat so can be perfect for chilly nights. Electricity (when you are not hooked up) is supplied by two leisure batteries. The price shown is for ‘conversion only’ meaning that the van will need to be bought separately. We can source and supply a van for you or help you find a suitable one. 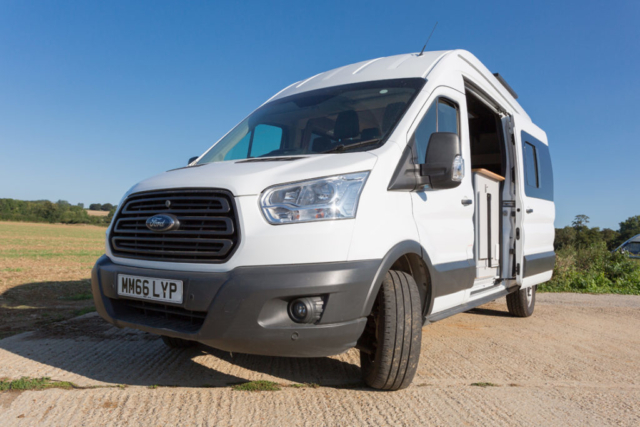 For a suitable base van you will need to budget at least £6,000 for a reasonable second hand one. 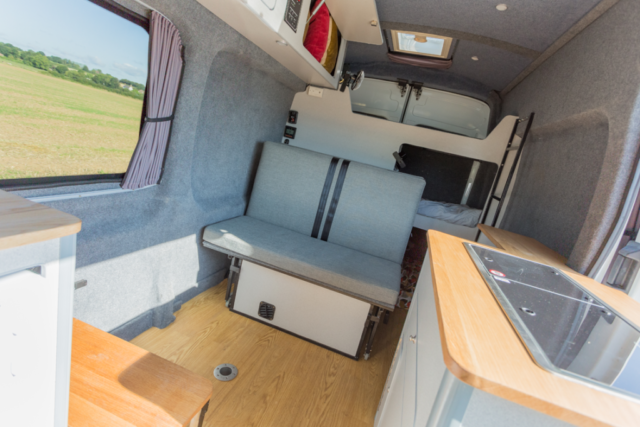 You can also find out more about our large sized van conversions and small van conversions. Love Campers off-set our anticipated carbon emissions through Climate Care. Find out more about our Environmental Policy. 07973 687950 or 07858 831116.